Hi, roadway I’m sharimg my recipe for Chicken Four Cheese Lasagne. 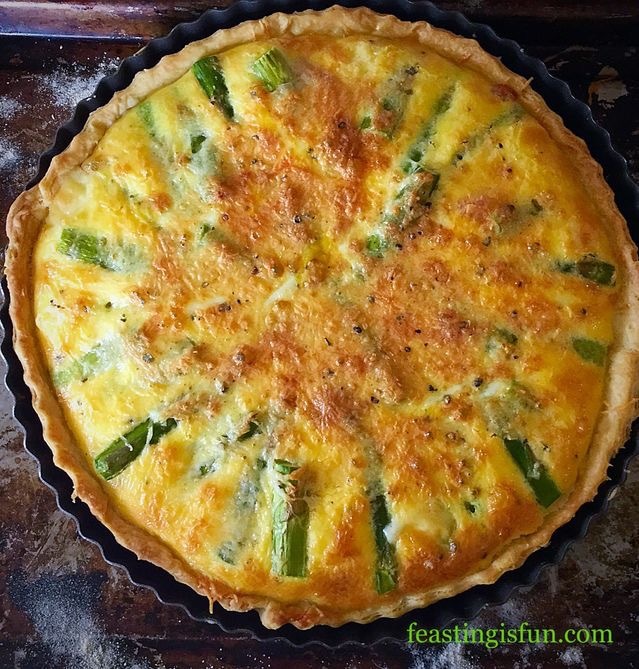 It is a tasty twist on a classic dish. While there are a few steps to follow, each part of the recipe is easy to follow. And there is no need to precook the lasagne sheets. Making this recipe using minced chicken is a tasty twist on an Italian classic. 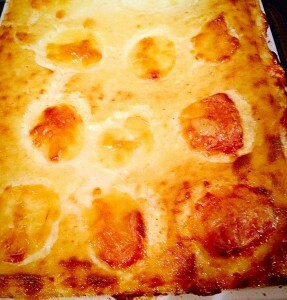 Delicious, cheese sauce topped, chicken lasagne. 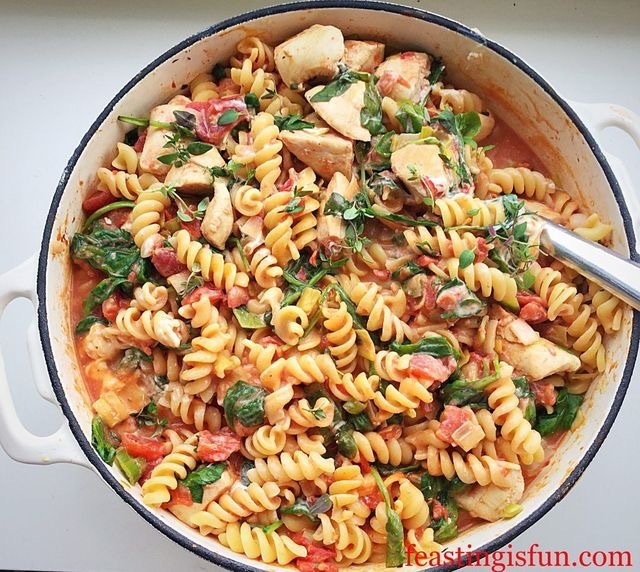 As a busy household, make ahead meals are a life, or should I say a sanity saver. A perfect, portable meal for sharing with others. 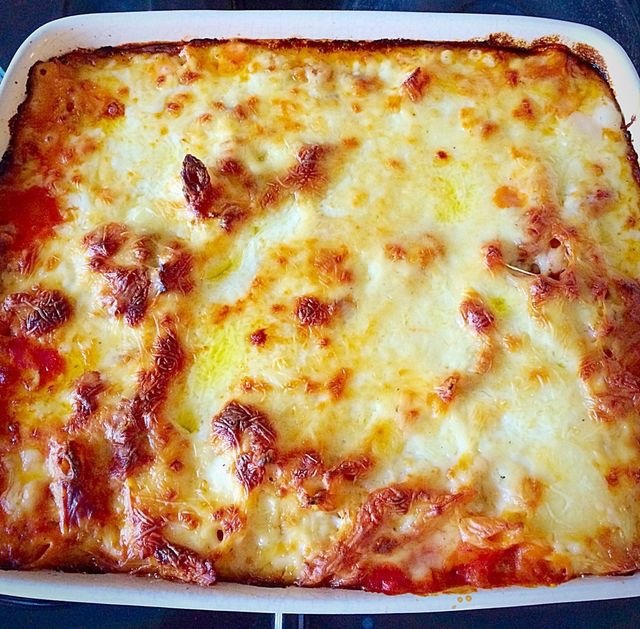 By substituting beef with minced chicken, the resulting baked lasagne becomes a lighter dish. Not lighter in calories, with the delicious four cheese sauce. Rather, not as heavy on the stomach. And the four cheese sauce was the result of me raiding the fridge for leftover Christmas cheese. 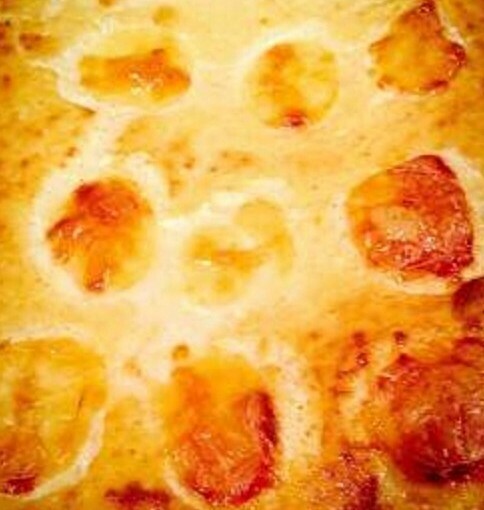 The Four Cheese Sauce tops of this lasagne perfectly!! Since minced chicken may not be available everywhere, minced turkey is a great substitute. Alternatively, processing skinless chicken breasts, thighs or a combination in a food processor would be another way to make your own chicken mince. 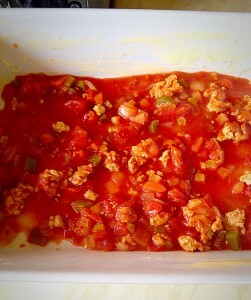 Another option, finely chopped chicken using a sharp knife would work and give the lasagne added texture. 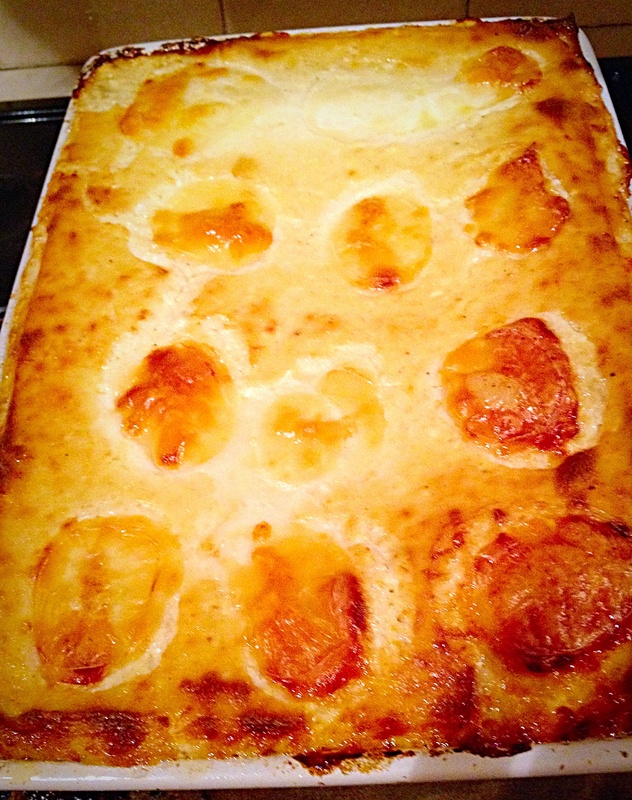 Recipe : Chicken Four Cheese Lasagne Serves 6-8 portions. 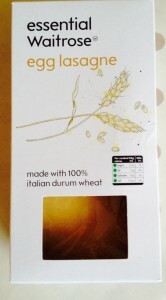 1 packet Dried Egg Lasagne Sheets 375g/13-14oz – dont worry if the packet requires pre-cooking you won’t need to. 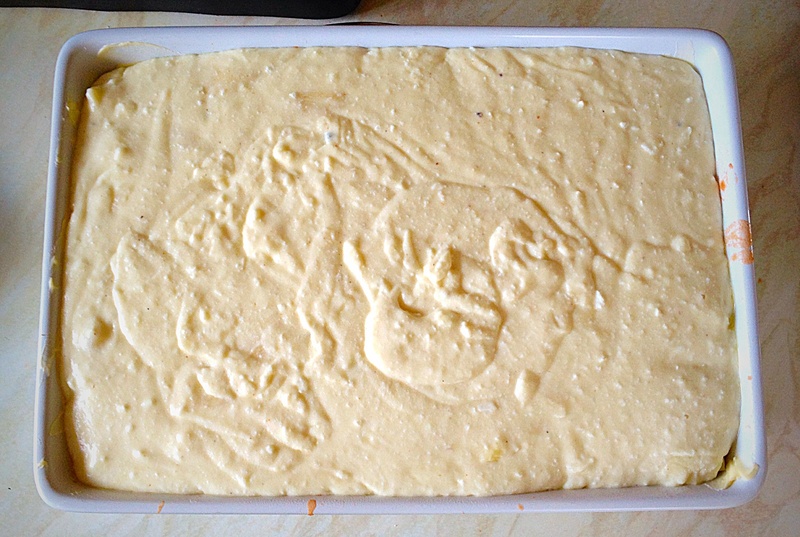 A rectangular, ovenproof dish approximately 30cm x 20cm x 9cm (12in x 8in x 3.5in) is needed to make this lasagne. First of all finely chop the onion, celery, green pepper and carrots. Heat the olive oil in a large sauté pan. Add the diced onion and sauté for 5 minutes over a medium heat until the onions start to turn translucent. Next add the diced celery to the pan and continue to sauté for a couple more minutes until the celery starts to soften. 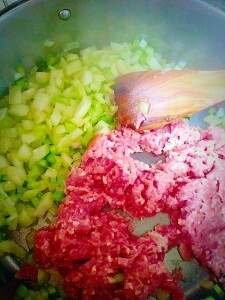 Push the onions and celery to one side of the pan and add the Chicken mince to the other side. Alternatively if you don’t have a large sauté pan, remove the onions and celery, into a separate dish and then add the Chicken to the pan. Cook the chicken, using a wooden spatula to break up the mince so large clumps of meat don’t form. Having a large sauté pan means you can cook all the ingredients in one go!!! 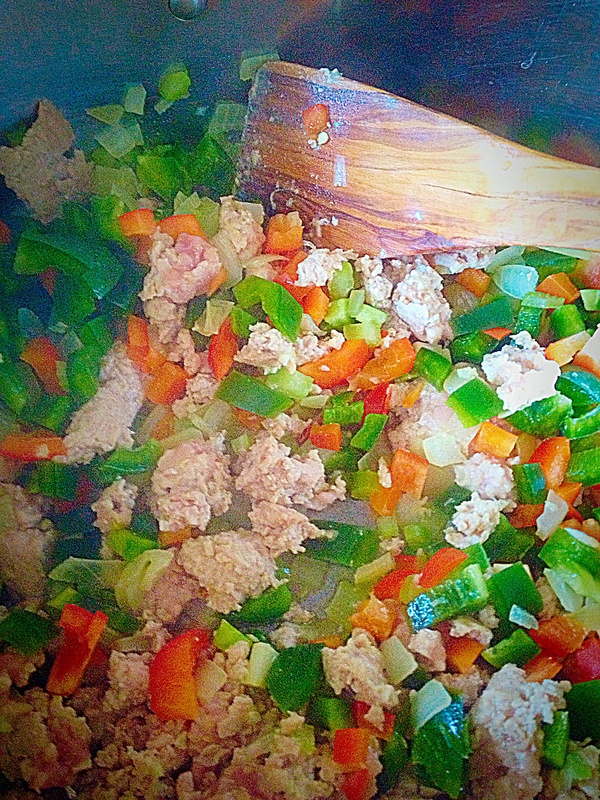 Unlike beef mince, the chicken mince will get lighter as it cooks. Cook the chicken turns opaque but not browned. Now add the carrots, green pepper and the minced garlic. 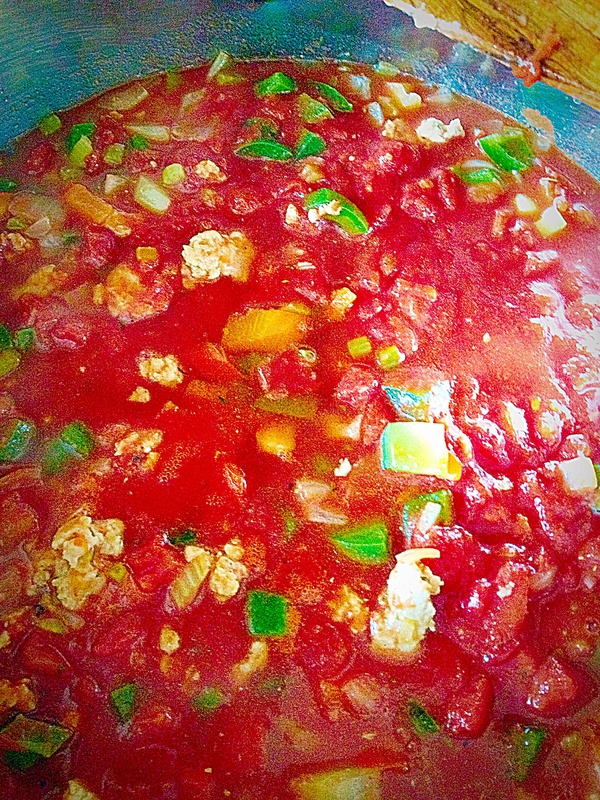 As soon as everything is mixed together add the tomatoes. Also fill each empty can almost to the top with water and add that to the pan. 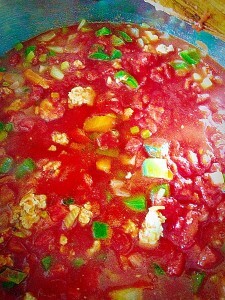 Add the tomato purée, dried or fresh chopped herbs. 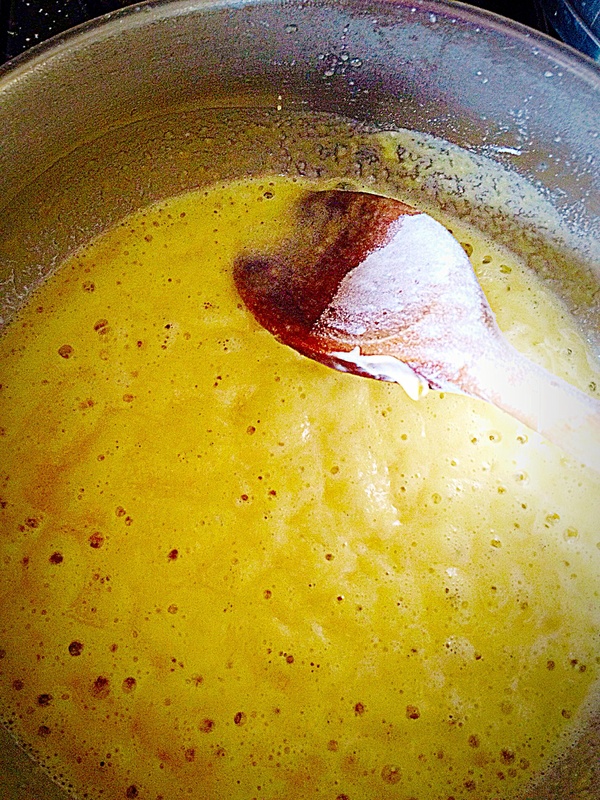 Give everything a good stir then add the sugar, half a teaspoon of salt and a good grinding of black pepper. Turn the heat to medium-low and leave to gently bubble away on the stove for an hour, stirring occasionally. Place a medium sized pan over a gentle heat. Add the butter and cook until melted and starting to sizzle. Next tip the flour on to the melted butter stirring constantly until combined and smooth. Continue to cook for a couple of minutes. 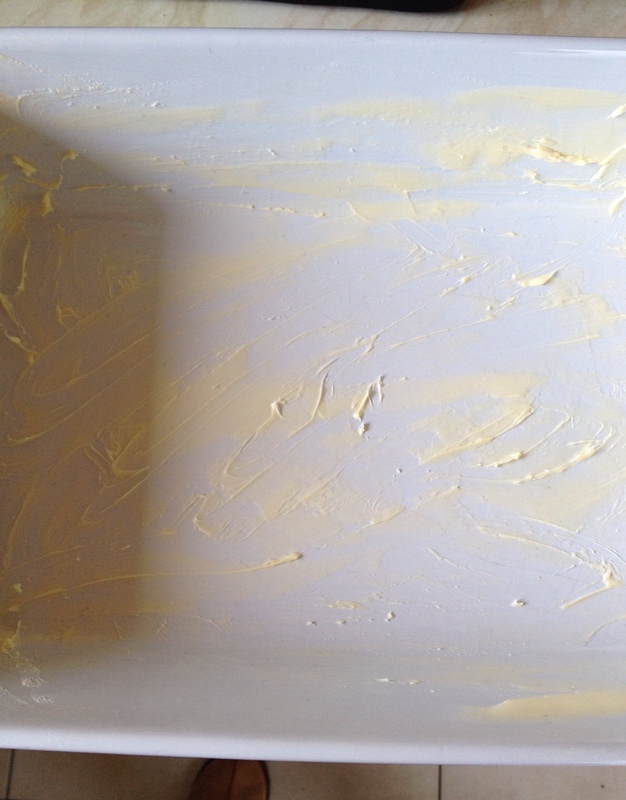 This is what the butter and flour should look like. 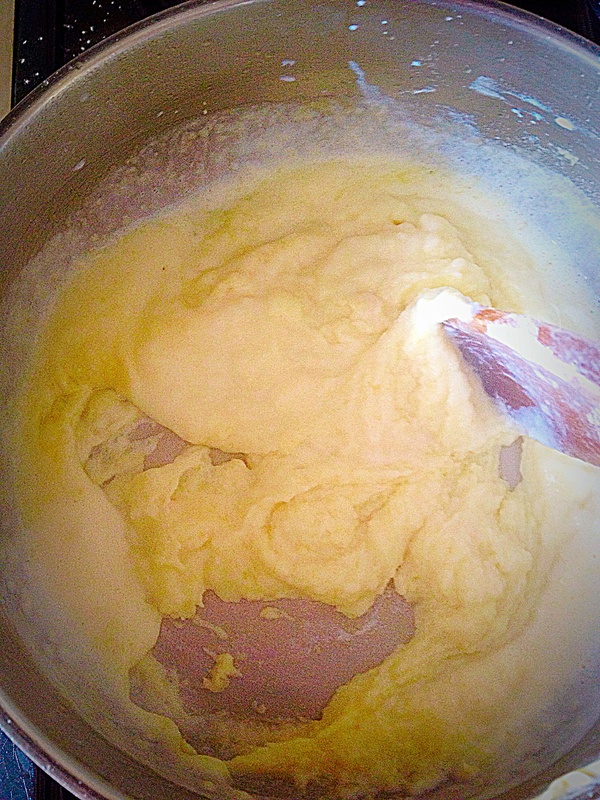 Start slowly adding the milk, stirring vigorously as the paste thickens. Continue stirring while adding small amounts of milk. The sauce will become very thick. 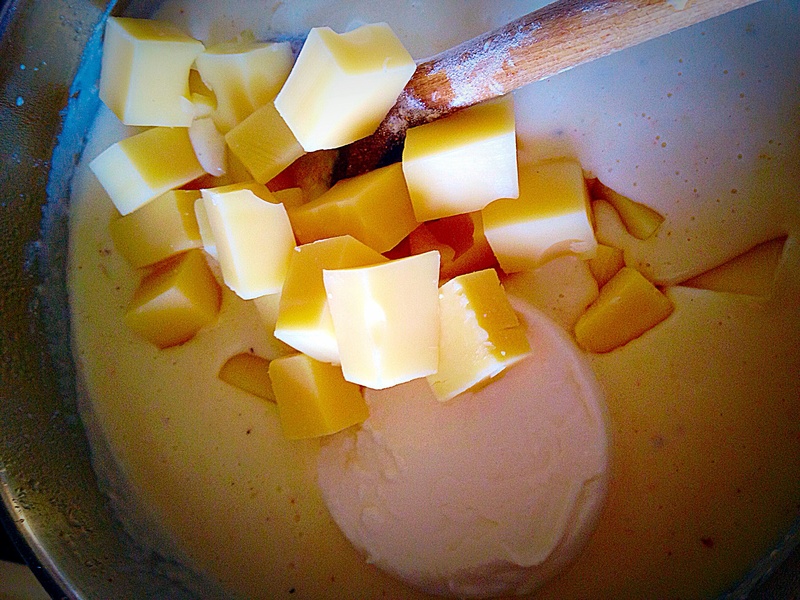 As more milk is added lumps may form, switch to a balloonwhisk at this stage. Continue until all the milk has been added and absorbed. 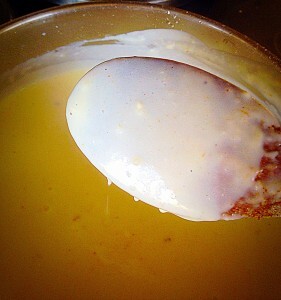 The sauce will be thick enough to cover the back of a spoon. No lumps here – if you squint!!!!!! Remove the pan from the heat and add the ricotta and the other cheeses (except the mozzarella), stir vigorously. The Ricotta gets dumped in and then add the hard cheeses. Add the nutmeg and season with salt and pepper to taste. Ricotta cheese will give the Four Cheese Sauce a slightly grainy texture, that’s normal. While grated cheese will melt into the sauce easily, cubed cheese will almost never become completely smooth, that’s ok as it will when it’s baked in the oven later. Also the addition of freshly ground nutmeg elevates the flavour above and beyond, but please, if you can, grate your own nutmeg. First of all liberally butter the ovenproof dish. Since I’ve made a LOT of lasagne buttering the dish before hand not only helps when serving, it also doesn’t require 3 days soaking to remove baked on lasagne. I wasn’t joking when I said that you don’t have to precook the lasagne sheets. Since I’ve used lots of different makes, some with ruffled edges, green spinach lasagne sheets, egg versus plain AND this recipe works with all types. 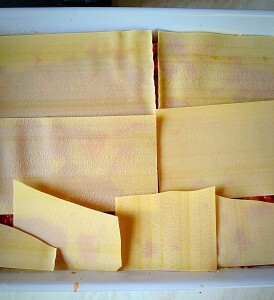 These are dried lasagne sheets. Any brand will do! As soon as you have buttered the dish place a layer of hot chicken lasagne sauce into the bottom of the dish, so that it is completely covered. The first layer is down, time to start building! 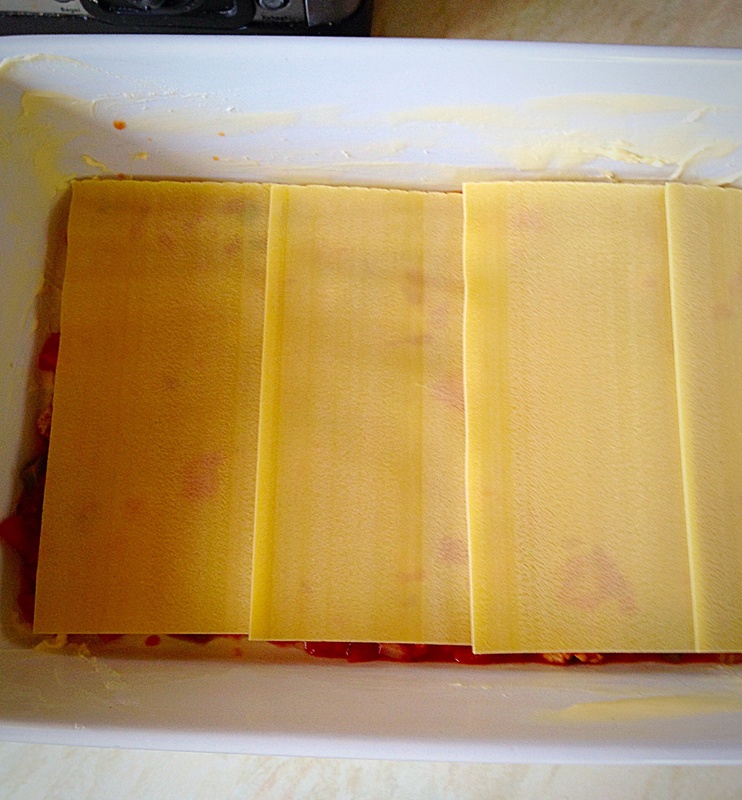 Next place enough lasagne sheets to cover the bottom layer. The layers should meet or very slightly overlap. If your lasagne sheets don’t fit exactly, just snap bits off to adjust them. 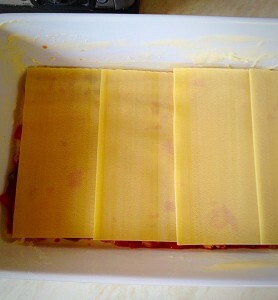 Repeat the sauce/lasagne sheet layering twice more finishing with a sheet layer. All the bits and pieces of the lasagne sheets will be covered by the Four Cheese Sauce. Pour the cooled cheese sauce all over the top of the lasagne sheets. Ooh this is going to be sooooo good – look at that yummy cheese sauce layer! 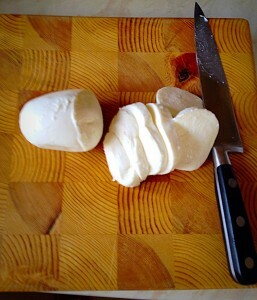 Drain and slice the mozzarella cheese. The final gooey, stringy, adornment for this fab lasagne dish! And now arrange the mozzarella slices on top of the cheese sauce. The Four Cheese Sauce tops off this lasagne perfectly. Finally leave the lasagne for at least 4 hours or ideally overnight. 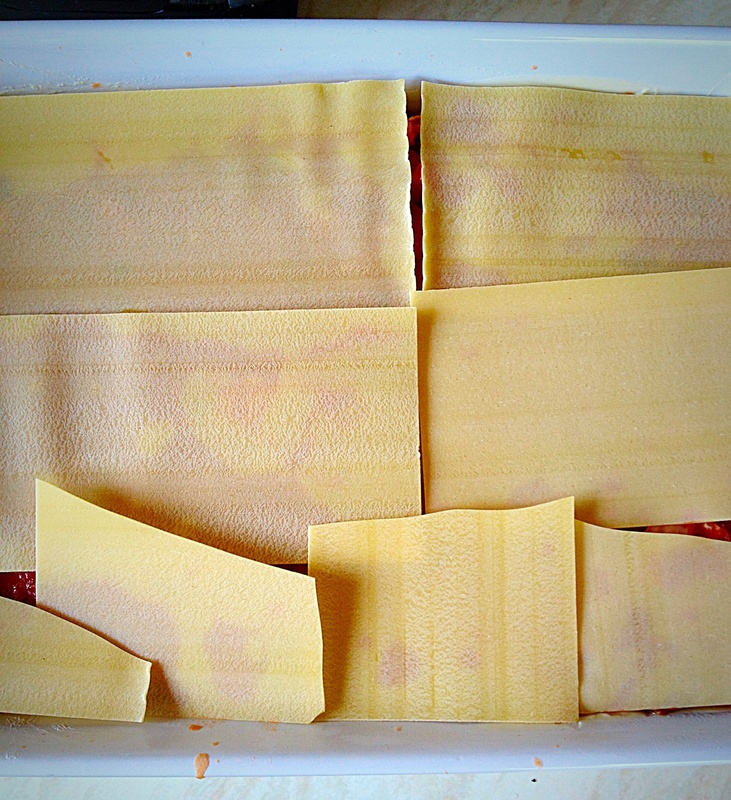 So that the dried lasagne slices have time to absorb moisture from both sauces. Also this dish can be made 1-2 days in advance, wrapped in cling film and left in the fridge. As soon as the lasagne is ready to bake preheat the oven to 180C/160C fan oven, 350F, gas mark 4. 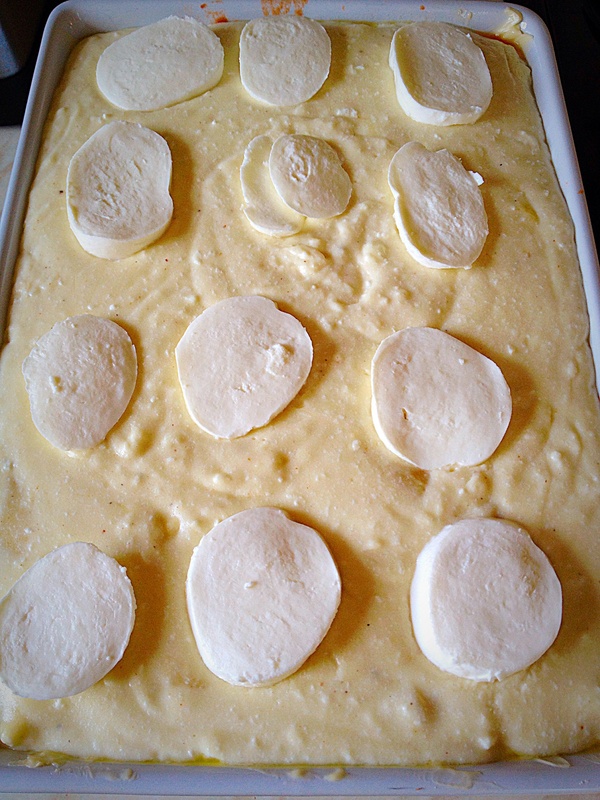 Place the lasagne dish on to a slightly larger baking tray; this dish can bubble up and over. Bake the lasagne for 1 1/2 hours until piping hot all the way through and golden brown. Delicious, cheese sauce topped, chicken lasagne – delish! Remove from the oven 10-15 minutes before serving. Doing so allows the lasagne to cool slightly and more importantly, hold it’s shape when served. This Chicken and Four Cheese Lasagne is delicious on it’s own, served with a salad and freshly baked Garlic Rosemary Focaccia Bead. Also it can be frozen at the pre-bake stage or in individual portions, wrapped tightly in foil and popped into the freezer. Or why not double the quantities and make an extra meal for the freezer? While traditional recipes will stand the test of time, importantly it’s fun to change things up. And sharing those changes is especially important as is sharing the food we make. Most of all if you know a new mum, or someone who has been ill for a while, or just a very busy family that you would like to bless, then this is THE perfect, portable, all in one meal for sharing!